Most Americans are familiar with the Back to the Future movie series, which features a specially modified DeLorean that can travel through time when it hits 88 miles per hour. 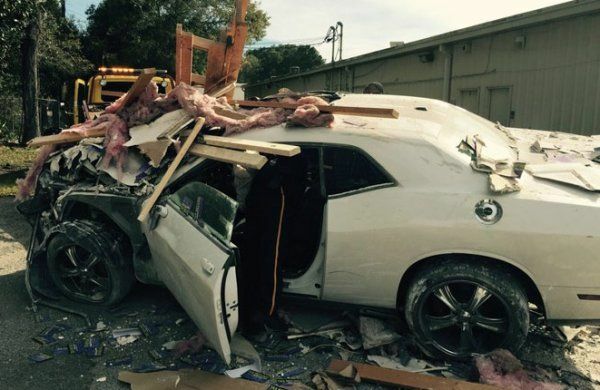 Evidently, a Florida man who owned a Dodge Challenger was making a similar attempt and when his car failed to leave modern times, he instead slammed into an office complex – destroying his Challenger, a coffin company and a tax preparation service office. I should point out right now that this is not a made up story, having originally been reported by a ABC television affiliate Channel 3 in the Pensacola area. While the details on the car are fairly short, it appears to be a 2008-2014 Dodge Challenger V6 model sporting a set of gaudy aftermarket chrome rims. The front of the car is pretty much gone, but there is no Hemi badge on the passenger’s side fender, leading me to believe that this is a V6 model. Now, the original news story doesn’t mention whether the owner had performed any modifications to his Dodge Challenger before making his failed time travel attempt. On the surface, it sounds a little crazy, but what if this guy made similar modifications to his Mopar muscle car to what Doc Brown did to the DeLorean? Doesn’t sound quite as crazy now, does it? Maybe he was low on plutonium or maybe his flux capacitor wasn’t dialed in quite right. There is also the possibility that his built this Dodge Challenger to travel through time, but he failed to reach 88 miles per hour before slamming head-long into the office building. Perhaps if he had a more powerful version, his plan would have panned out a little better. We laugh and shake our heads, but if humans are ever going to be able to travel through time, we will have to rely on the groundbreaking efforts of Doc Brown, Marty McFly and the owner of this Dodge Challenger. Maybe next time, his Challenger will prove the haters wrong by going back in time and preventing this initial accident from ever happening. Of course, if that happened, then this article will have never been written so let’s wait a second and see if the picture above goes blank all Back to the Future style. Still reading? Picture still there? Bummer. The good news is that this Dodge Challenger ran through the coffin business and tax prep office on the weekend, so there was no one at work. As a result, there were no injuries within those offices and – amazingly – even the driver of the Challenger came out without any major injuries. The driver was cited with reckless driving and he will likely need to replace his Dodge Challenger. I am guessing that the insurance company might not cover failed time travel attempts.